One of the connecting points I have with my daughter, Lexi, is our passion to talk about all sorts of different topics. Sometimes our conversations are not the normal mother daughter type of conversations. This morning was one of those times when I am not sure how we started the conversation or how we got to the end. I think it started talking about mermaids, their history and how some people believe they are real, gargoyles and their history then entered the conversation. Before I knew it we progressed to the history of pagan religions, Baal worship, Druids and human sacrifice. Eventually we ended the conversation talking about Matthew 19:16-30. In this story Jesus talks to the young rich man about what he needs to do to get to heaven. In verse 16 the man asks, how he can earn his way to eternal life. I have spent a lot of time thinking about this man and why he was determined to work his way to heaven instead of accepting the grace offered by Jesus. Comparing the two opened my eyes to a new concept. Works is like a scale. 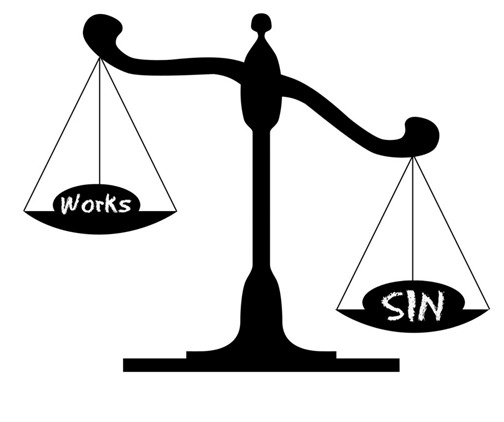 On one side of the scale is sin and on the other side is our good works. No matter how much good works we pile on the scale the sin side is always heavier. We add sin on faster than we can do good works. Works are weights that oppress us, resulting in killing our souls and making us slaves to the scale. Grace is a gift that is freely given. It doesn’t require that you do anything to obtain it. It is abundant and never runs out. It is a compassionate approach to everlasting forgiveness.